Nurata city is located in Navoi region, 230 km from Samarkand. It gained city status in 1976; hitherto it was a small town. Today it is the administrative and cultural center of the the mountain district of Navoi region. There are several legends about city origin. One of them says that its appearance is associated with Alexander the Great, who built here Nur fortress, now we can see only ruins. According to another version, the city arose many centuries ago, after the fall of the meteorite. There was appeared healing spring at the place where was fallen “firestone”. Hence there is the name "Nurota" which means “father’s ray”. As the locals say, sometimes there is a strange glow over the source. The population of the town is 28,000 people. In the VI century BC there were conducted strategic and military conspiracies. Defense of the city was Nur fortress. Nurata is an important religious center, which attracts thousands of pilgrims and travelers from all over Central Asia. This is a land of hospitable and hardworking people, famous masters of livestock. When you go to the city, you can see nice view - the Kyzyl Kum desert. One of the most important centers of Islam is complex "Chashma", which is visited not only by believers from nearby cities, but also from other countries. Nurata miracle is Aydarkul Lake with clear water and an abundance of various fishes. During the excursion, you can also see other attractions such as Namazgokh Mosque, Juma Mosque, Nur-ata mazar. 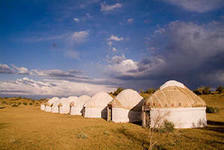 Tourists are impressed by camel riding and yurt camps. 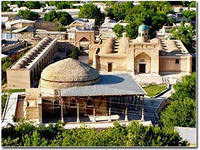 Despite, Nurata is a small town, it is one of the most historically significant cities in the Republic of Uzbekistan.